Reykjavik, Iceland, settled in the 9th century AD, is one of the most unique places on the planet and the northernmost capital city in the world. The name Reykjavic means “smoky bay” and refers to the steam rising from nearby hot springs. Reykjavic is one of the most unusual and enjoyable places we have ever visited. 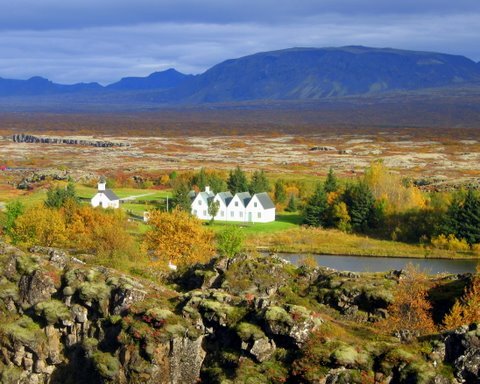 Iceland is a land of volcanoes and glaciers, lava fields, green pastures, boiling thermal springs and ice cold rivers. Despite its’ name, Iceland is not a frozen tundra in winter. During most winter months, it is warmer than New York City. Strokkur Geyser is world famous and, like the United States’ Old faithful, erupts at regular internals. Tours are available to visit this must-see Icelandic natural wonder. Another point of interest is Gullfoss - Iceland’s most famous waterfall. Its’ water begins at the base of glaciers and then work their way steadily for miles through beautiful and undeveloped green pastures. For dining with a great view, the Pearl offers a rotating dining room with fantastic views of the city. Situated on Oskjuhlid Hill on top of the huge tanks in which natural hot water is stored for heating the city, the Pearl’s glass dome houses a rotating restaurant serving fine cuisine, a café, and a museum. In 1930 law was passed designating Thingvellir National Park as “a protected national shrine for all Icelanders, the perpetual property of the Icelandic nation under the preservation of parliament, never to be sold or mortgaged.” The park is a geological masterpiece and includes the historic meeting place of the Althing - one of the oldest political assemblies on earth which originated in 930 AD. Visit http://www.thingvellir.is/english for more info. The Reykjavic Welcome Card makes it very easy to enjoy the best that the city has to offer. Available for 24, 48 or 72 hours, the card offers free admission to all of Reykjavík’s thermal pools, many museums and other attractions, unlimited travel on the Reykjavík buses, discounts at shops and restaurants and free internet access. Reykjavik, Iceland is like no other place. With its beautiful bay, colorful homes, geothermal springs, friendly people, safe streets, unique history and distinctive natural wonders, Reykjavik is one of our favorite destinations. Watch our Reykjavik, Iceland video below.